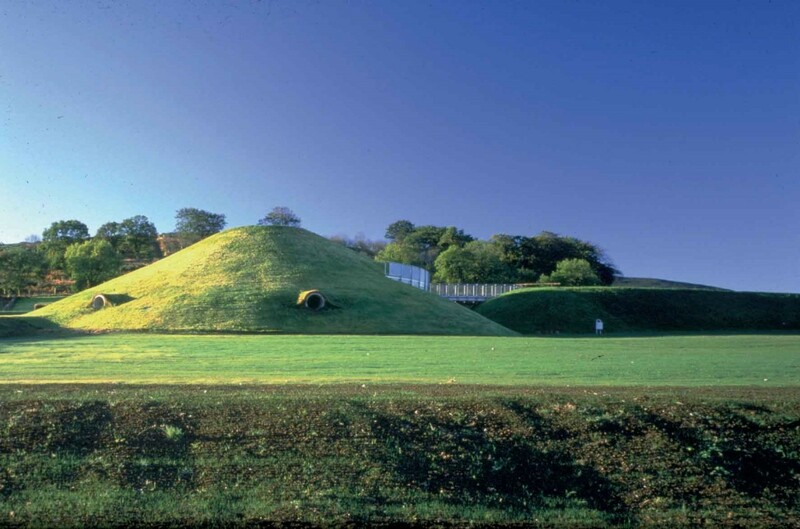 The Archaeolink Prehistory Park at Oyne opened in 1997 as a trust-run centre. But the council was forced to take control of the prehistory park in 2005 after spending £1.5 m of taxpayers’ money in a bid to keep the centre afloat as its visitor numbers, originally projected at 100,000 a year, plunged to just over 19,000. The park finally closed its doors in Feb 2011. Edward Cullinan Architects are based in southern England and this is their first completed work in Scotland. They were latterly commissioned to design a Visitor Gateway for the Botanic Gardens Edinburgh. Archaeolink is a ‘living history park’ family attraction with indoor and outdoor exhibitions, hands on activities and workshops. The name Archaeolink was intended by its inventors to suggest a popular bridge into the ancient past of archaeology, and the intention of the Archaeolink Trust when it was formed by Grampian Enterprise and Gordon District Council in 1991 was to create a visitor centre in the hilly and forested landscape of rural Aberdeenshire which would realise this notion. This put us off at first. Why recreate the past we thought? But we soon discovered that the proposed site was in a landscape of breathtaking beauty and saw that we had no need to recreate the past, only to provide a window. Whilst the Trust was supported by experts in archaeology, regional history and folklore who could directly inform the exhibition content, the evolution of a brief for the building was very much a learning process for them. The brief for Archaeolink Prehistory Park developed over an 18 month period from Autumn 1994 in parallel with applications to major funding bodies, environmental impact analysis, outline then detailed planning applications accompanied by public consultation and often heated, but constructive, public meetings. The Trust’s business plan envisaged a building opening for the 1997 season, an ambition that was adhered to throughout. In the precious context of Stonehenge, we had learned how to form buildings by making incisions in the ground, allowing the landscape of the Salisbury Plain to roll on over whilst using the undulation of the land to offer surprise panoramas from within. At Archaeolink, this principle is overlaid with another device arising directly from the need to provide distinct outdoor exhibition areas housing historically separate exhibitions. We had seen an early schematic drawing prepared for the Trust showing radiating hedges for visual separation and, rather than this crude device, realised that we could use the building, or at least branches from it, to perform the same function more discreetly. This led to a building placed centrally on an open site with radiating earth ramp, bunds and embankments emanating from it forming a car park in one quadrant and exhibition areas, each with quite separate characteristics, in the other three. The archaeological/historical landscape is astonishingly rich, with no less than seven iron age forts surmounting sharply delineated conical hills in the immediate vicinity including Berryhill Fort on the site itself, and with the vast backdrop of the Bennachie ridge, a string of summits once held in Pictish legend to be a sleeping giant. We were inspired by this landscape and by the abstract and interconnecting qualities of archaeological sites such as Silbury Hill and the stone rings of Orkney. From the road entrance an axial view connects the Archaeolink building with Berryhill Fort and on to the sleeping giant of Bennachie. This axis guides the visitor from the road first to the building and then subsequently on from its roof up the parkland exhibition on to the upper site and, most powerfully, back down again. A long gentle earth ramp stretches from one side of the building, cast off but anchored in by a lightweight bridge, and most significantly aligned on the view down the Garioch valley towards the conical hill of Dunnideer with its ruinous castle on top standing starkly like a Roman arch against the sky. We had learned about the foreshortening effect upon landmarks of anchoring them in with a framed view with our observation of the Abbey tower seen diagonally across the courtyard in our design for Fountains Abbey Visitor Centre. Whilst we struggled initially with the brief for black box exhibition spaces, we managed to integrate the experience of Event’s exhibitions with an experience of the surrounding landscape and its real archaeology. The exhibition areas at the Archaeolink Prehistory Park were designed with peephole windows between them to give strategic views out in a necklace of rooms around a central auditorium. An unfolded view to outside is given in the final exhibition space. The otherwise blind nature of the exhibition spaces and the need to create a larger volume for the central A/V theatre led to a 21m span concrete domed structure with a conical grass hill as its external surface expression. Laid out south of the dome is a long hallway 3.5m high and fully glazed on either side, which acts as a single open plan circulation and orientation area giving fully revealed panoramic views of the open landscape. This was conceived as a foil to the closed and dark spaces of the exhibition, with paved surfaces connecting directly to outside through transparent walls. The layout allows free circulation to all parts. In order for the various support facilities to be easily identifiable in the linear space without confusing the simplicity of the volume, these are housed in colourful ‘drums’ which read as large freestanding pieces of furniture. Finishes throughout Archaeolink are simple and durable. External materials are limited to the primaries of grass and glass with a minimum of slender steel in bridge and balustrades. Between a suspended outer plane of single glazed balustrade dropping down to make lobbies, and an inner plane of thermally broken double glazing, shelter from sun and rain is given by the oversailing roof edge. Automatically controlled blue fabric shades limit direct solar glare on sunny days and white soffit panels bounce in more light on dark gloomy days. Internally, the concrete structure is exposed throughout to allow the passage of heat between the Archaeolink building and the insulated underground heat store beyond in an annual heat- cool cycle. We worked very closely with the engineers and main contractor in the detailed development of the shuttering design for the fairfaced concrete and the co-ordination of insulation umbrella, drainage and retention of the earth roofs. We also worked closely with specialist subcontractors designing and installing waterproofing and curtain walling. The works were split between an advance enabling contract administered by Douglas Forrest architects and the main building contract, which ran from May 1996, until the public launch in mid June this year. Although the Archaeolink Prehistory Park building process was inevitably messy, with so much earth moving on a clay site, already the seeding grass has started to heal over the wound and to re-establish connections with the neighbouring fields . It is only a matter of time before the growth of the shelterbelts completes the integration of Archaeolink with the Garioch valley so that it becomes a distinct man made formation in a continuous landscape.